This past week I've been quite absorbed by a new book - Alabama Studio Sewing + Design: A Guide to Hand-Sewing an Alabama Chanin Wardrobe by Natalie Chanin. Maybe absorbed isn't quite the right word. Possibly obsessed. Natalie is the founder of the clothing line Alabama Chanin. You can check out the company site here, but you'll actually see a lot more images if you just use Google Images. The clothing is quite remarkable. Although the actual garment designs are relatively simple, they are all completely hand sewn by women in Alabama, made from organic locally grown cotton, and feature a range of embellishments that are stunningly labour intensive. Here's a montage to give you an idea of what the surfaces look like. And these lovely things are every bit as expensive as you would imagine. But in an interesting turn, Chanin has made the clothing potentially available to a wider market by not only selling completely customizable sew-it-yourself kits and supplies, but also publishing 3 books about how to make the clothes, each of which contain full size patterns. This most recent book (I have since ordered the first two!) 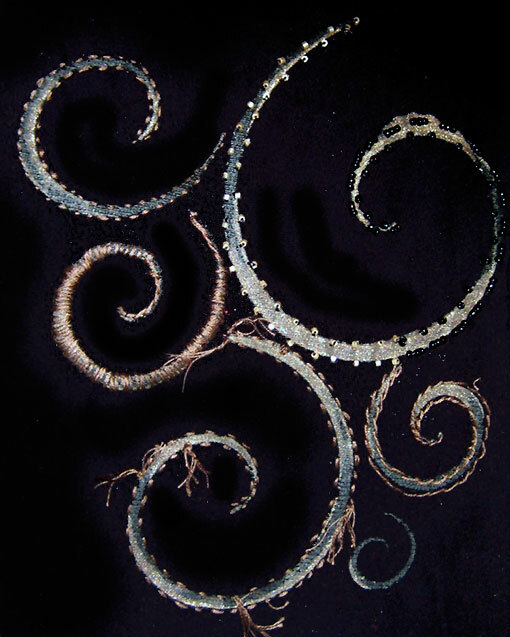 shows the embellishment techniques in great detail. What I find so fascinating is the juxtaposition of a relatively utilitarian fabric (basically T shirt jersey) and decorative embellishment techniques that might usually be used on more formal garments. 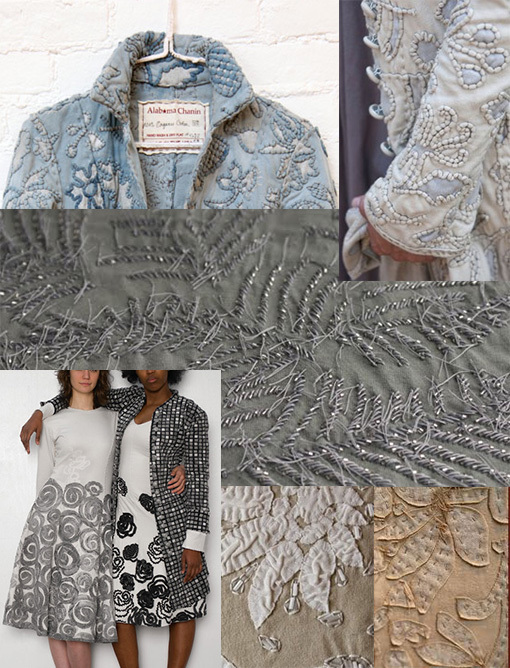 Essentially the Alabama Chanin approach is to stencil a pattern onto the cotton jersey, then apply a series of different surface techniques such as reverse appliqué, negative reverse appliqué, embroidery, beading, couching and many more. I've been having a great time making some samples and improvising some personal variations. Sample making is imperative here - it is not as simple as it looks. 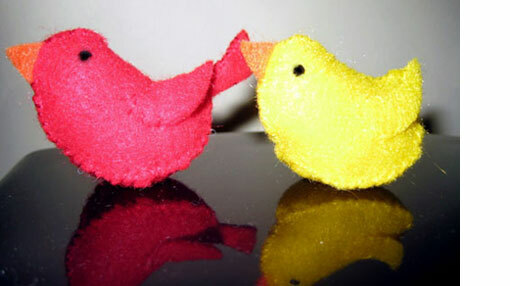 The choice of colour, thread type, even needle size can make a big difference in the final look. 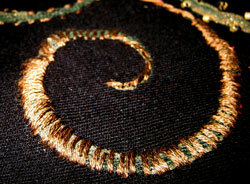 And it makes you very aware of the need to practice hand stitching!! Here are my samples of some of the Alabama Chanin stencil and stitching combinations. I've had trouble shooting these on my little camera - the actual colours are bronze paint and stitching on black French Terry. The image at left is approximately actual size. 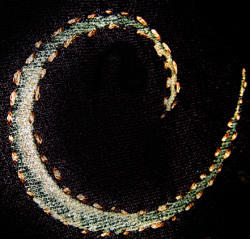 The running stitch is used to outline stencilled areas and is also used in the reverse and negative reverse appliqué techniques. The trick to this is achieving a consistently small stitch size and managing the tension. 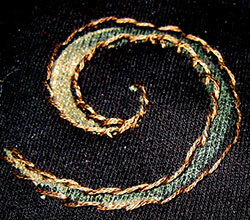 The stitch can also be worked with exposed knots as shown above - a technique that produces "Alabama Fur". Worked here in both bronze and black, this gives a lot of dimension to the surface. 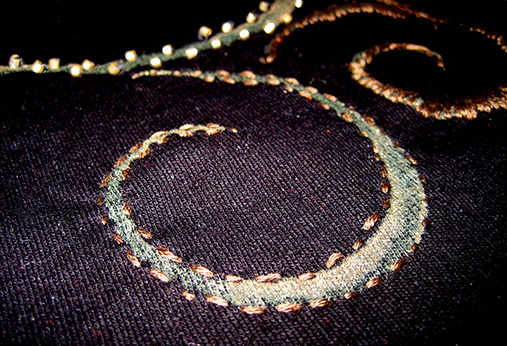 The French Terry fabric here can support quite a lot of beading, but on jersey, I think double layered fabric would be necessary. This sample looks better in real life! My photography skills are lacking a bit. This may be the hardest one in which to achieve a consistent result. All this stitching is done un-hooped (due to the stretchy nature of the fabric) which adds to the difficulty here. It will take me some practice to get the spacing between the stitches more standardized (difficult working around curves). 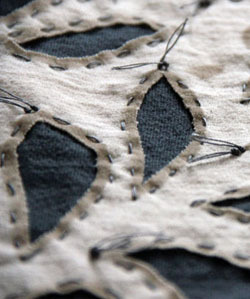 From a design perspective, this stitch could allow some interesting play with depth. In my sample, the thread is a different tone of the paint colour which in real life (not in this image) creates a shading effect on the outside edges of the curve. Nice. It could also be very effective if the thread matched the base fabric, allowing a glimpse of the stencil colour to show through. This is very straight forward and different intensities of the outline can be achieved by shortening or lengthening the stitch. Perhaps the least interesting outline for me. This is the one outline method that I have not done a sample for. I can't see me using it right now. It involves outlining the stencil shapes with a tube of pulled jersey that is stitched through at regular intervals. Yes, those tubes again. You can see samples of this in the montage image at the top of this post. Looks fabulous and adds volume - which is something I don't really need! 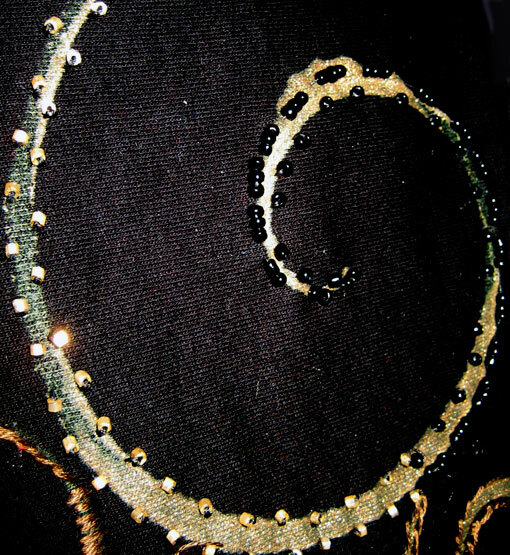 Next post - applique methods. Inbetween the dots there were rectangles.